Bamboo shoots were first identified as a vegetable in ancient China during the early Han Dynasty (202 BC-AD 220). Their use in cooking expanded over the years to many countries and cultures. Bamboo shoots are the tender young growth of bamboo, a huge tropical grass that can grow many feet tall. The shoots are harvested before they reach one foot in height and before they are about two weeks old. The young shoots are crisp and tender like asparagus, with a flavour that is close to that of corn. 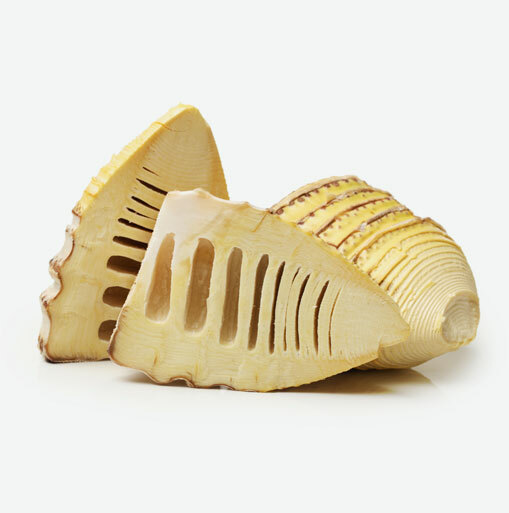 Bamboo shoots are widely used in Asian cooking. Bamboo shoots are commonly available canned, though fresh bamboo is far superior in taste and texture. Bamboo shoots are low in calories and fat. Just half a cup of the tender shoots contain only 14 calories and about 0.5 gm of fat. The same half cup provides the body with 2.5 gms of fibre and helps to lower cholesterol. Bamboo shoots are a valuable defense against colon cancer and are rich in potassium which helps to maintain normal blood pressure and heart rate. Fresh bamboo shoots need to be kept away from exposure to sunlight so that they don’t become bitter. Fresh shoots should be kept refrigerated in water that is changed daily. When refrigerated, they can last from several days to a week before beginning to lose their flavour. Fresh bamboo shoots must be cleaned and cooked before eating. Raw, they are bitter and difficult to digest. First cut off the root ends, remove the tough outer leaves (the more tender leaves are edible, however) and pare away any tough fibrous sections before cooking. Slice the bamboo against the grain into 1/8 inch slices. Very tender shoots can be sliced in any fashion. Drop shoots into boiling water and cook for about 20 minutes uncovered, to allow bitter substances in the bamboo to dissipate. Bamboo shoots that are still bitter after cooking can be given a second cooking in fresh water for approximately 5 minutes longer. Bamboo shoots should remain slightly crisp once cooked. Toss these tender shoots with a little sesame oil and soy sauce and serve as a vegetable side dish. Add some bamboo shoots to salads, soups, stir fries or mixed vegetable dishes. They can be marinated in rice vinegar, sesame oil and soy sauce for a few hours.